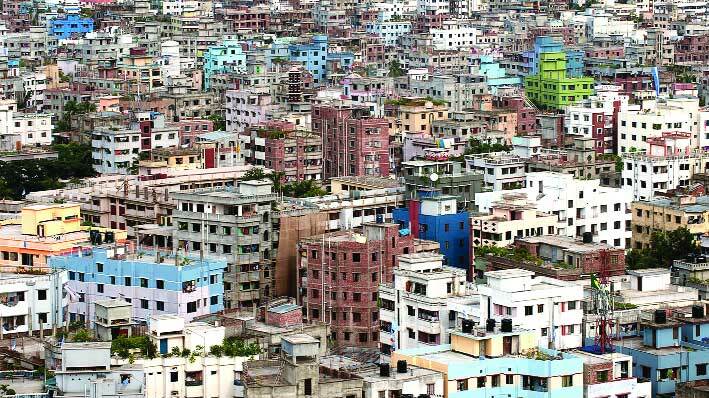 From its beginning as a small city with a few thousand people, Dhaka actually old-timer city today, it has become one of the fastest growing mega cities of the world. Its existence as a major urban cluster has been stable over a period of 400 years. Throughout the 400 years old Dhaka has seen most of the periods and several ups and downs of our national rule and cultural dominance, such as, in the 16th century during the reign of Mughal, 200-year period of British, 23-year period of Pakistan, and ongoing 44-year period of Bangladesh. With the birth of Pakistan in 1947, Dhaka became the capital city of the new province of East Pakistan but with the independence in the year of 1971 Dhaka become the capital and the most significant geo-political city of Bangladesh. It is said that the national politics in Bangladesh takes its ground from the politics of Dhaka city. Historically, when a political movement starts in Dhaka city successfully, it finds its way out soon throughout the whole country, During the Pakistan era our major national movements were held surrounding the Dhaka city and evidently they made pathway for our glorious independence. After our independence, Dhaka city never lost its political importance. In 1990s, movement against the autocracy was driven from this city and even till now this city is no less important for raising voice against any ill action or oppression of the government. As the capital of Bangladesh, Dhaka held city polls several times. The last election of Dhaka City Corporation took place in April 2002 and the five-year limited era for the office of the elected representative was over in May 2007. We know that the last city corporation mayor was Sadeque Hossain Khoka, he has been also the representative of BNP, the main opposition party now. Although the 2007-08 military backed caretaker government attempted to hold an election but it was tumbled for various reasons. Consequently, despite his term had deceased in 2007, he continued until 2011 in absence of another election. In 2011 the time out mayor Khoka was ousted by the partition of Dhaka city in two parts, to say, Dhaka City North and Dhaka City South by appointing two temporary administrators for two parts. Thus, Dhaka City Corporation has been running without any election or elected representative since 2011. When the present Awami League (AL) formed the government in 2009, they overlooked to opposite party’s mayor in the city administration and development activities. Then they divided the Dhaka city without trying to hold a city election. It is well said that the partition of Dhaka city was solely for removing the mayor Khoka from his City Corporation office.In November 30, 2011 the present government divided Dhaka city between two parts comprising South City Corporation with 56 words and North City Corporation with 36 words, through the passage of a bill that amended the Local Government Act, 2009. The distribution of population and words between two parts of the Dhaka City Corporations seem extremely unreasonable. Much time has passed since Dhaka City Corporation was divided into two, on the excuse that it would make the management more efficient. But this divided city corporation, dependent on administrators, has done nothing for civil amenities. Sufferings have just mounted. Since 2011 general people and civil society have been urging to hold the city election but the government showed no headache for that. With an excuse of apex Court’s ruling, the government delayed the city poll for five years. Expert addressed the unreasonable delay of Dhaka City poll not for the lame excuse of apex Court’s ruling but the government’s fear of falling in the city election. Government never dares to lose its influence over Dhaka city, the center of all Bangladesh politics. Government’s fear of falling in the Dhaka city election is no more an assumption after the dry out of votes in its favour in demo elections in other city corporations throughout the country. City elections held in 2013 in Rajshahi, Khulna, Barishal & Sylhate but all of are elected the opposite party’s representatives. AL also experienced the nosedivein the newly formed Gazipur City Corporation neighboring Dhaka city, which has been known as the strong zone for AL since the independence of Bangladesh. For these reasons government kept itself far away from holding or even discussing the Dhaka city election. But recently they are interested to hold election in Dhaka city to terminate the demands of national election by opposition party’s alliance. Why the Govt. is trying to hold Dhaka city election in this national crisis time which is an unavoidable question for us. The evident reason is to sack opposition political alliance’s urge for national election. If opposition political alliance attends the election then they are not doing any kind of movement for sure throughout the election time. Then Govt. will be saying that we have restored everything properly. If doesn’t attend Govt. will win easily. It is evident that even if the opposition alliance doesn’t attend the city election their movement will be relaxed within the city. There will be tighter and harsher actions of the law enforcement agencies in Dhaka city during the election time for the wake of a peaceful election, so more opposition people will be caught and shot at sight. Opposition alliance leaders already have been made bound in political killing, torture, abduction, plenty of law-suits and go into hiding, and the political circumstance of opposition parties is not healthier for sustaining anymore political repression by government. So Govt. knows there will be no major resistance for holding the city election as well as wining in a partisan poll. In addition, with the Dhaka city election, people’s concentration will be turned from opposition alliance’s call for national election to narrow city election. By holding 5 January election in 2014 Government outlawed the democracy and restored the autocracy in a new format. In 5 January election the ruling AL won154 parliamentary seats out of 300 uncontested and, hence, secured the required 151 seats to continue the power without any election. And in the rest 146 seats it appointed some so-called domestic oppositionally to make an obedient contest to show an election to be held. Statistically, according to data shown by some non-government and international election observation and survey authorities, only 12 to 14 percent of total voters casted their votes in that one-sided election. In reality, no election was held to uphold the people’s solemn expression of the will guaranteed in Article 7 of our constitution. People were deprived of their right to freedom of expression for choosing their representative to rule by the holding of one-sided 5Januaryelection. Before that election, Government’s commitment was to hold another election after discussion with all political parties.But after election, government moved from its pre-election commitment to continue power. Government’s move from holding a national with consensus among the political parties seems to be hypocrisy with the whole nation. It is worth saying that people never consented in 5 January election and the scenario of deserted polling centers on that day proves this argument undoubtedly. So an evil situation continues in our country and our hard-earned democracy does not exist here. Opposition alliance is continuing its political movement, boycott, calling for a national election. Apart from the opposition alliance, civil society, media personality, foreign diplomats, business organizations and so on are urging for a political discussion. In this situation, discussion has no alternative for pacifying the current political unrest. But the government is dogged not to hold any discussion or whatsoever that my interrupt to continue its current one-sided power. As a consequence of long term political unrest, more than hundred people have died and countless have injured by cocktail and petrol bombs, crossfire, so-called gun-fighting, shootouts and so forth. The number of deaths and injuries is on the rise with passing of every single day with no possibility of appease soon. Only an effective discussion among political parties and democratically elected government can bring an end to this problem. In this situation, running city election will be challenging, considering the prevailing political circumstances of the country because the main opposition party BNP will be absent in the election and will make more resistance in holding Dhaka city poll. Therefore, the situation will get more worsenand the life leading in the city will be at stake. On the other hand, disregarding all these factors, the Government has already taken necessary logistic preparations and announced gazette for holding the long overdue Dhaka city corporation elections in late May or early June that remain pending due to complexity over boundary demarcations and politically unrest. Government buoyed representatives are also begin there polls campaign by festoon, fostering, to-let & doing mass conciseness grogram for calling vote. Dhaka City Corporation election may be a good ploy for the government for deviating the people’s attention from opposition alliance’s movement for a free and fair election to that but people themselves will not forget their stance for a fair and free election. Still a free and fair election is the hot talk in our tea-stalls, public-gatherings, family chats, academic debates, social ceremonies and so forth throughout the country. People are not dumb enough to be fooled in this way and they will not forgive of their democratic rights. People’s power is the largest power in this world and when they will have chance they will throw out all the hypostases in the dustbin of age. Government should reconsider the issue of political discussion and holding of another national election with participation of all to restore our long-dreamed democracy instead of untimely Dhaka City Polls.